*** The term “robot” is actually coined by Karel Capek , a Czech playwright in his play Rossum’s Universal Robots in 1921. *** In 1985 a robot ,Puma 560 was used to place a needle for a brain biopsy using CT (Computed Tomography) guidance . ***First Laproscopic surgery was perfomed in 1987 (laproscopic surgery involves operations within the abdominal or pelvic cavities). So What do you mean by a robotic surgery? Robotic surgery is a surgery in which the surgeon performs surgery b manipulating the hands of a robot or any mechanical device that operates automatically with human like skills. In this type of robot the tool is moved under surgeon command.the tool is used to hold devices such as blades, bieves etc. 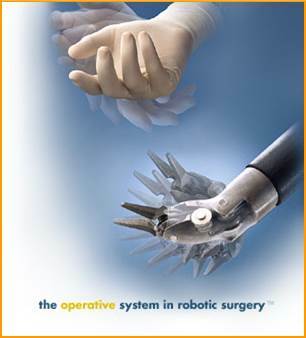 In this type of robot the tool as well as the fingers are moved by surgeons command, the fingers are moved as per command to perform the surgery. 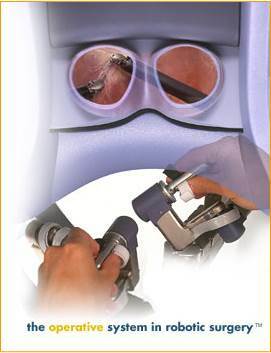 A robotic system made by an American company designed to facilitate complex surgery using a minimally invasive approach. Costing around 2.5 million us dollars the robotic system has been used to repair cardiac valve and for prostrate removals.the future application of Da Vinci robotic system can be in telesurgery where a surgeon [For Example] sitting in India can perform a surgery on a patient in Antarctica. The robotic system consists of four interactive robotics arms controlled from the console, three of the arms are for the tool that hold objects such as scissors , bovies etc.the fourth arm carries an endoscopic camera with two lenses that gives the surgeon steroscopic vision. 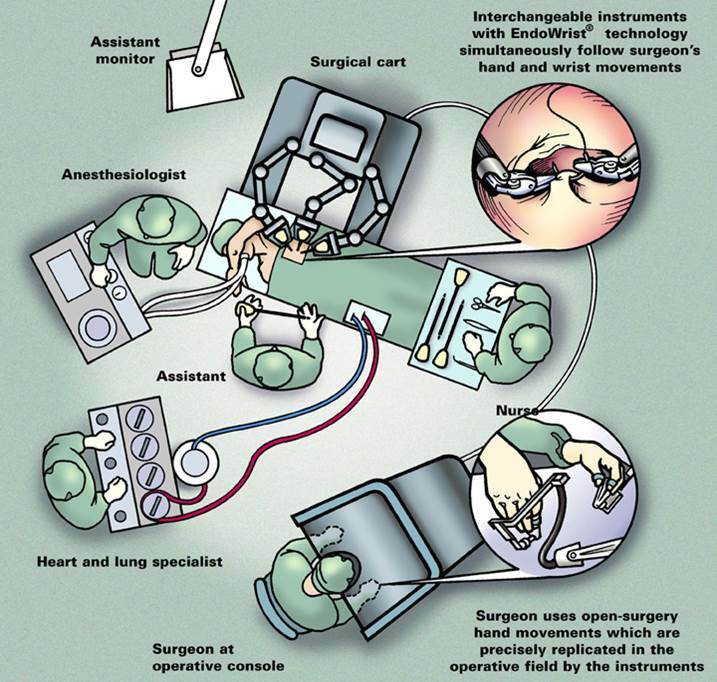 Ø Robotic surgery is but one example of such technology that MAY reduce operative morbidity, hospital stay, and recovery, while POTENTIALLY improving clinical outcomes.